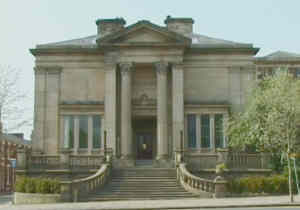 Immediately opposite the entrance to the Walks stands the Harris Institute, now part of the University of Central Lancashire. This building was originally built in 1849 for The Insitution for the Diffusion of Useful Knowledge. The Institution had been established in 1828, in Cannon Street, and was initially concerned with educating working people, with the ideal of 'perfect equality'. Unfortunately, 'perfect equality' did not last very long and by the early 1840's working men were a minority among bankers, professional men and 'gentlemen'. 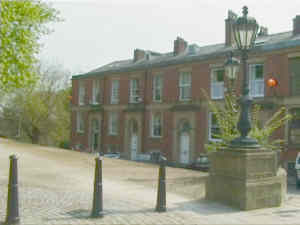 The houses of Avenham Colonnade, facing Avenham Walk, were built as a colonnaded row but now lack this identifying feature. 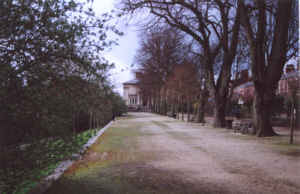 These houses had large service basements, opening into the gardens behind and usually two or three resident servants. Looking north to the entrance to the Walks with the Harris Institute in the background. 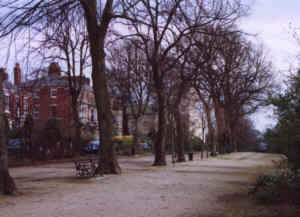 Looking south with Bushell Place on the left.